The Lurie Garden at Millenium Park is in bloom! The Garden is designed to change seasonally and highlight the Chicago motto (Urbs in Horto, or, City in a Garden). 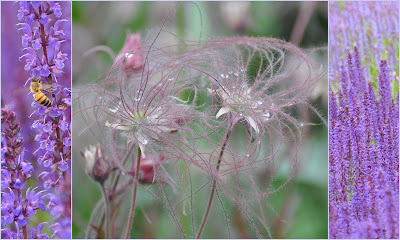 Two of the many pretty and interesting Spring plants are Meadow Sage (the deep purple flowers - with and without bees) and Prairie Smoke (with the pink plumes). This Blackburnian Warbler was having a great time in the Grant Park trees recently. He sang and flitted around the trees on a warm morning. I'm posting a few more pictures of male and female Blackburnian Warblers on my bird watching blog, which is here. This seagull was making sure that everyone obeyed the traffic lights near Navy Pier. Surfing ... um ... Paddling? I guess when the surf's not up, you have to improvise and get back to shore somehow. Caught this guy paddling back to shore at Montrose Beach recently. Painted advertisements on buildings are an endangered species. Either the building gets torn down or another building goes up next to it that hides these old time ads. I think they are rather interesting and provide a peek at the past. This ad for "The Boston Store" stands out amid the newer buildings in the Loop. I'd never noticed this ad before and had never heard of the Boston Store. So I "googled" it. It had quite the history in Chicago. According to the site www.chicago.urban-history.org, where you can see an antique postcard of The Boston Store, the store was owned by Charles Netcher. He named it The Boston Store because he "hoped the New England city's reputation in merchandising would add credibility to his establishment". It expanded quickly in the late 1800s and eventually took up the corner of State and Madison. Charles Netcher's wife, Mollie, turned it into a full service department store and it was a competitor of Marshall Field's and Carson Pirie Scott. It had a cigar factory on one floor that produced three million cigars annually. It also had "a post office, a Western Union office, a savings bank, a barber shop, a first-aid station, several soda fountains and restaurants, and an observation tower 325 feet above street level. ... For the four thousand Chicagoans employed by the firm, there were private reading rooms, employee lunchrooms, and a full-sized tennis court on the roof." By the late 1930s, business had begun to decline, apparently because Ms. Netcher didn't modernize the store or its business ways - she didn't expand to the suburbs and kept a cash-only policy. The store closed in 1948. The building was renovated in 2001 and now has a Sears store on the first few levels. Yesterday was the eighth Bike the Drive put together by the Active Transportation Alliance. (It used to be called the Chicagoland Bike Federation but they recently changed the name to incorporate walkers and public transportation riders.) The annual event involves closing down Lake Shore Drive (US 41) to motorized vehicle traffic for several hours, allowing bikes to ride north from Grant Park up to Bryn Mawr, back south to the Museum of Science and Industry then back north to the end at Grant Park (about 30 miles round trip). I didn't participate yesterday but I have in the past and it is pretty great to bike on Lake Shore Drive - it is a different perspective than the Lakefront Trail even though that trail runs next to Lake Shore Drive. And, you find out that there are some pretty long steep hills on the Drive that you do not feel in a car but are quite evident on a bicycle. But the neat part is the silence on Bike The Drive morning. It was so quiet yesterday morning that I could hear the el train rumbling through downtown, over a half-mile away, when I took this picture from the Cancer Survivors Park (which is built on the spot that used to be the infamous Lake Shore Drive "S" Curve.). Sometimes, you don't even get the same sunrise in the same day. These pictures are about 45 minutes apart. The sunrise started out looking like the big red sunrises over the African savannas you see in pictures. Some lake fog then developed and turned the whole scene gold. This little bird is a Magnolia Warbler. We first saw one a few weeks ago at the Magic Hedge. I tried to get a photo but it kept hiding behind leaves. 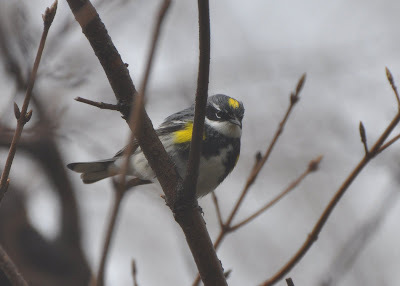 Over the next few weeks, more Magnolia Warblers started to show up and a few, like this one which was recently in Grant Park, were downright camera hogs! 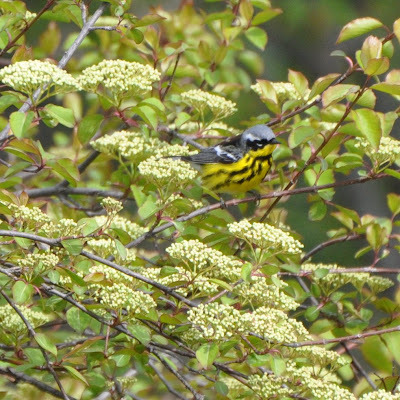 I have a few more Magnolia Warbler pictures at my birdwatching blog, which is here. The Farmers' Markets are in season now. I'm lucky, between the Green City Market and the City of Chicago Farmers Markets, I can go to a market for fresh vegetables, fruit, meat, cheese, and baked goods every day except Monday and Friday. It's still early so the fruit is still a little ways off. But after months of root vegetables, we're being rewarded with asparagus, morel mushrooms, and leeks galore (a perfect springtime feast). We get both green and purple asparagus (purple is a little sweeter) and I love it steamed, grilled, and just raw. Monroe Harbor is filling up with its summer residents. Green Fest, an even that focuses on environmentally friendly products and actions that you can take, was held at Navy Pier this past weekend. The City of Chicago partnered with Redmoon Theater to promote the $800 Savings Challenge. Reduce heating temperature three degrees. Increase cooling temperature three degrees. Save four gallons of water per day, by turning off the faucet when brushing and shaving, and by cutting shower time by a minute. Replace nine incandescent light bulbs with compact fluorescent bulbs. Replace your home air conditioner filter. Use a power strip for all appliances and electronics that remain electrified in standby mode and turn off the power strip whenever the appliance is not in use. Turn off three 60-watt bulbs for two hours per day. Eliminate one 10-mile car trip per week. Keep your car tuned up and tires properly inflated. Replace outdoor lighting with solar lights. Disconnect downspouts and add a rain barrel. Recycle the Sunday newspaper instead of throwing it in the garbage. Back around Easter, I posted a photo of some dioramas of Marshmallow Peeps. Perhaps those Peeps escaped and are hopping around the Magic Hedge. Or ... maybe these are Yellow Warblers coming back for the summer. There's two more pictures of the Yellow Warbler as well as photos of other Chicago birds on my other blog on birdwatching. The Chicago Transit Authority has tried for years to come up with names for the 'el' lines that would make it easy for tourists and riders to decipher. I've lived here long enough to remember Congress-Douglas, Howard-Englewood-Jackson, Lake-DanRyan, Ravenswood, Evanston Express, and Skokie Swift. Those morphed into Congress-Douglas-O'Hare, Howard Dan Ryan (there was a short-lived and ill-fated attempt to abbreviate that as "Ho-Dar"), Lake-Englewood-Jackson (calling that "LE Jack" was similarly short-lived), Ravenswood, Evanston, and Skokie. Then Midway was added. Its current incarnation is colors. In order of the above names, it is Blue Line, Red Line, Green Line, Brown Line, Purple Line, Yellow Line, and Orange Line. The Pink Line is the newest. Trouble is, we're running out of colors. If they add any lines, we'll have to use names like Chartreuse, Apricot, or Soylent Green. Here is another one of the art panels that line the Chicago Riverwalk. This one is about the Chicago Bridges. Apparently, after the Chicago Fire, the bridges were re-built as wooden swing bridges. The first iron bridge was built at Rush Street in 1856. It was destroyed by a cattle stampede (those were the wild early days of Chicago) in 1863 but re-built a year later. This is the sixth sunrise photo I've posted. Looking back at them, I'm reminded that we should watch and appreciate each one, because that particular sunrise (or sunset) is a one shot deal. This is an evolving public art sculpture on Michigan Avenue. It is comprised of three free standing clear boxes. According to the explanatory sign, the boxes are designed to collect "fill" (objects that are usually thrown away). As more items are collected (it isn't clear how/where they are collecting the items), more clear boxes full of fill will be added to the sculpture. The sponsor (Denco/UrbanWorks), hopes that the sculpture will make people aware of how many single items are thrown away. Even though it's only one bottle, several "one bottles" take up quite a bit of space. And a whole bunch of those "one bottles" can be re-used/recycled into something else. The first one is devoted to compact fluorescent lightbulbs; the second is small bottles; the third is wine bottles. The sailboat runs are getting larger as the weather gets warmer. (Hmmm. Thursday it was 77 degrees; today it is 54 degrees.) Let me rephrase that: "The sailboat runs are getting larger as we get further into the month of May." Today's run was 22 boats - a pretty good number. After the boats get through all the bridges, there is one last step: going through the Chicago Locks. The locks keep Lake Michigan from draining into the DesPlaines and Mississippi Rivers (remember, the Chicago River was reversed in the 1800s - an official engineering marvel). 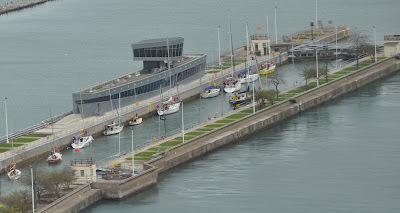 It is a neat experience to go through the locks - either in your own boat or on one of the architecture/sightseeing cruise boats. There are rules about the order that boats enter and leave the locks. Everyone must wear a life jacket (but you should anyway on Lake Michigan). You have to hold on to ropes that hang along the sides of the lock's canal in order to secure your boat during the one-to-four foot water surges that occur when the locks open. In this picture, the boats are lining up along the walls waiting for the Lake Michigan side to open so they can get on with their sailing. These are hardy sailors because it's pretty chilly and windy on the lake today. There are several places in Chicago that are set aside as preserves to foster birdlife. One of these places is called the Magic Hedge, near Montrose Harbor. That's where we saw this Yellow-Rumped Warbler. I was going to post all the bird photos here but I started taking so many this would have become Daily Chicago Bird. So I started another blog just on Chicago birds. I've previously posted a photo of the city's project to extend the riverwalk. This is the view of the work they're doing from Michigan Avenue to Wabash. I don't know what these trees are called but the flower petals are small, white, and round. When they blow off the trees, as they did in the Aon Center Plaza, they look like confetti has been liberally sprinkled all over the ground and in the water fountains. It's rather festive -- though that is probably not an opinion shared by the groundskeepers who use leaf blowers to clear the "confetti" off the sidewalk. I'm not sure if this is a remnant from a construction or de-construction project. The pile of bricks makes me think de-construction. It was just sitting in an empty lot on Lake Street. 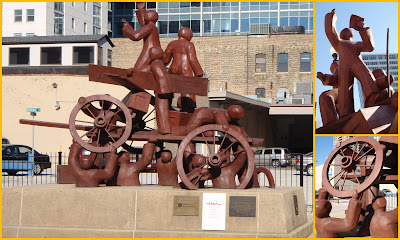 There is a Haymarket Tragedy Memorial Sculpture at Randolph and DesPlaines in Chicago. Plaques on the sculpture tell the story of the event. In short: On May 4, 1886, a public meeting had been organized to protest deaths of workers during a labor lockout (related to a strike regarding the eight-hour workday). The speakers addressed political, social, and labor issues. When police came to disperse the meeting, a bomb was thrown into the midst, killing at least eleven people. They never figured out who threw the bomb (or with whom the person was affiliated). Afterward, four of the organizers and speakers were sentenced and hung, one was killed in jail. Three additional organizers and speakers were sentenced but later pardoned. Over the years the Haymarket Tragedy (which used to be called the Haymarket Riot), has become a symbol for free speech, public assembly, organized labor, the eight hour work day, law enforcement, and justice.